QuickBooks provides a couple of handy commands and tools that you can use to change the prices that you charge customers for your products and services. Keep reading to discover more about both of these handy aids. 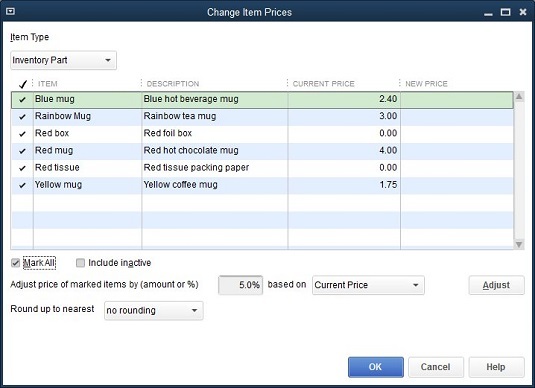 The Change Item Prices command, which appears on the Customers menu, displays the Change Item Prices dialog box. This dialog box lets you change prices of a bunch of items at one time by an amount or percentage. To use the Change Item Prices dialog box, first select the items whose prices you want to change by clicking the check-mark column. Next, use the Adjust Price of Marked Items by (Amount or %) box to specify the dollar amount or the percentage amount by which you want to change the price. If you want to change the price of selected items by $2, for example, enter $2 in the box. If you want to change the price of selected items by 5 percent, enter 5% in the box. Use the Based On drop-down list to indicate the base to which you want to add the amount of percentage. After you identify the items that you want to reprice and the way that you want to reprice them, click the Adjust button. QuickBooks recalculates the prices and displays this information in the New Price column. If you want to change the prices for the items selected, click OK. The Change Item Prices dialog box. If you don’t like the prices listed in the New Price column, you can just keep tinkering with the value in the Adjust Price of Marked Items by (Amount or %) box, clicking the Adjust button to refresh the numbers in the New Price column, and clicking OK only when you’re satisfied. Price levels are kind of weird; they let you individually adjust the price of an item up or down. If you’ve agreed to discount items by 10 percent for a certain customer, for example, you can easily do this by using a price level to knock the price down by 10 percent whenever you’re invoicing that customer. To use price levels, you first have to set up the price levels by using the Price Level List command. After you set up your price levels, you adjust prices by using price levels when you create an invoice. To create a price level, choose the Lists → Price Level List command. When you do, QuickBooks displays the Price Level List window (not shown). To create a price level, click the Price Level button and then choose Price Level → New. 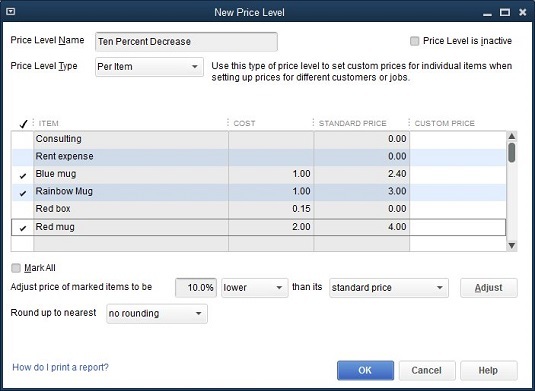 QuickBooks displays the New Price Level window. Name the price level change by using the Price Level Name box. Select the items to which you want to apply the price level by clicking them. (QuickBooks marks selected items with a check.) Then use the Adjust Price of Marked Items to Be boxes to indicate that this price level increases or decreases the sales price some percentage higher or lower than the standard price. Finally, use the Round Up to Nearest drop-down list to specify whether and how QuickBooks should round off its calculations. If you click the Adjust button, QuickBooks shows the adjusted price in the Custom Price column. The New Price Level window. To use a price level, you create an invoice in the usual way. Click the Price Each column for the item that you want to reprice by using the price level. When you do, QuickBooks turns the Price Each column into a drop-down list. If you click the arrow button that opens the drop-down list, QuickBooks displays both the base rate price and any price levels. If you choose a price level, QuickBooks adjusts the price for the price level change. Selecting the 10 percent price level change bumps the price from $4.00 to $3.60. In other words, the “Ten Percent Decrease” price level change decreases the default price by 10 percent, or 40 cents. Choosing a price level with the Create Invoices window. QuickBooks also lets you set a default price level for a customer. When such a default price level is set, QuickBooks automatically uses the appropriate price level when you choose that customer. The Price Level box appears on the Additional Info tabs of the New Customer and Edit Customer windows. One more thing you should know about setting prices. 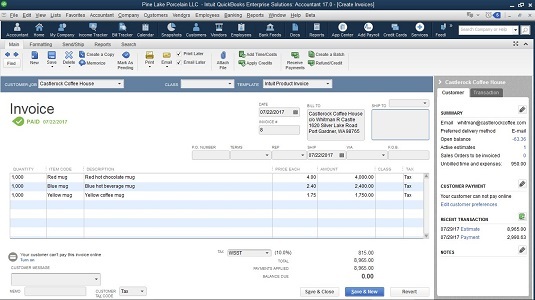 QuickBooks also provides an advanced pricing function, which you turn on by choosing the Edit → Preferences command, selecting the Sales & Customers preference, clicking the Company Preferences tab, and then selecting the Enable Advanced Pricing button. When you enable advanced pricing, you convert any price levels you’ve previously defined (see preceding paragraphs) to price rules that you can tell QuickBooks to apply to items, item types, particular vendors, customers, customer types, and job types. After you turn on advanced pricing, you can choose the Lists → Price Rule List command to display the Price Rule List window. To convert a price level to a working price rule, double-click the new price rule and then use the Edit Price Rule dialog box (not shown) to describe the rules QuickBooks should use for automatically repricing some item according to your specified rules. This is an Enterprise-only feature.